My Rude/Abusive page shows two AskUbuntu questions that I can't see (or remember) my comments on. How can I verify that they're rude, and learn from them? As Dan says, these posts aren't things you said, they're things others said that you flagged. The only flag against you was an answer where you started it with an abbreviated swear phrase. You edited it out yourself and the world moved on. As learning experiences go, you appear to have learned that "don't swear in answers" was the way forward and I think you were right. As Oli says, your flag summary page shows your own flags, not flags raised by others on your posts or comments. The other thing to keep in mind is that the filter you applied--which is apparent from the ?group=3 part of the URL--does not show any comment flags. It only shows rude/abusive flags on posts. 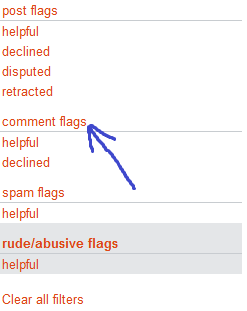 All flags a user has raised on comments, even if the user selected "rude or abusive" in the flagging dialog, are placed in "comment flags" group in the user's flag summary page. Yours may not look quite the same. In particular, any groups with pending flags will list a waiting for review status, any groups with expired flags will list an aged away status, and you may have--or not have--helpful, declined, disputed, or retracted flags in different groups than I do. Within each group, a status is shown only if it (currently) applies to at least one flag you have raised. Turning on the rude/abusive flags filter actually hides all comment flags including those raised using the rude or abusive comment flag reason, because they are placed together in a different group (which I have shown with the blue hand-drawn arrow). post flags (?group=1) - Flags on questions and answers. This includes all flag types except spam and rude or abusive, which have their own flag groups. Tag wikis are also posts, but they don't support flagging. comment flags (?group=4) - Flags on comments, no matter the flag type. Flags raised here on meta go on your separate flag summary page on meta, accessible to you from your meta profile. When you flag messages in chat, those flags do not appear in the Ask Ubuntu flag summary, because chat is operated separately from the main site. Why can't I add a comment to others' questions? Is it is possible to search my comment activity history?